We love seeing things fly through the air. Build and launch rockets, engineer egg-parachutes, launch water balloons out of the giant slingshot, and craft other systems that defy gravity. 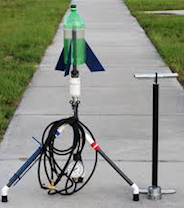 We build estes rockets that launch using model rocket engines. We have water pressure and air rockets. We also found a crazy water rocket kit from our time at camp in Shanghai, China (we tested it in a park next to a business complex and the rocket flew so far it went into the business complex and landed directly next to a series of very serious Chinese businessmen). After seeing that crazy flight path, we had to bring a kit to the USA for Ajax Adventure Camp. It is also a dream to create a giant trebuchet at camp. If campers would like to help construct one, please – let’s do it!